Carlos Suárez-Quian, PhD, teaches a fourth-year clinical gross anatomy elective designed for students choosing residencies that require a more in-depth knowledge of gross anatomy. (From left) Fourth-year students Jim Han, Brian Monahan, Mia Garino, Arthur Jurao, Jack Kent and Monika Gasiorek pose with Suárez-Quian. (February 1, 2019) — Despite attending lectures and memorizing diagrams of the human body, the sights, sounds and smells of gross anatomy lab can stir up unexpected emotions in first-year medical students. 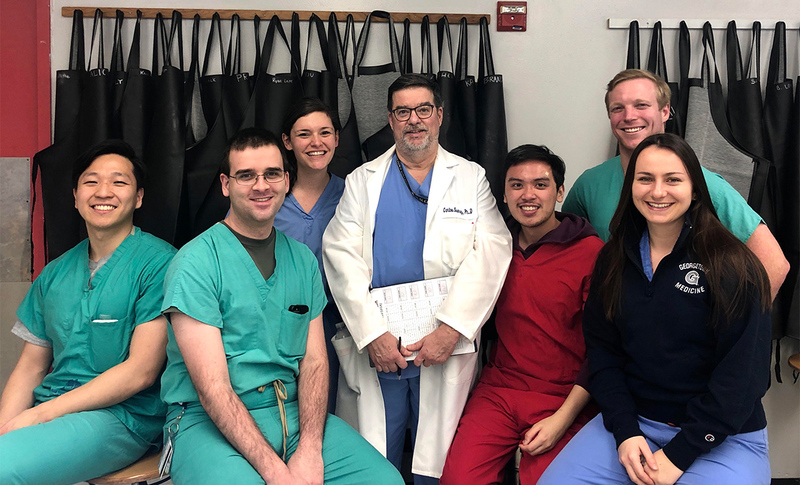 Therefore, a group of students with anatomy lab experience volunteer to support the first-year medical students at Georgetown University School of Medicine (GUSOM) taking gross anatomy. As a fourth-year medical student taking an elective in clinical gross anatomy, Monika Gasiorek (M’19) recalled being hesitant in anatomy lab during her first year, not unlike many first-year students she assists, and emphasized that her confidence came with experience and time. 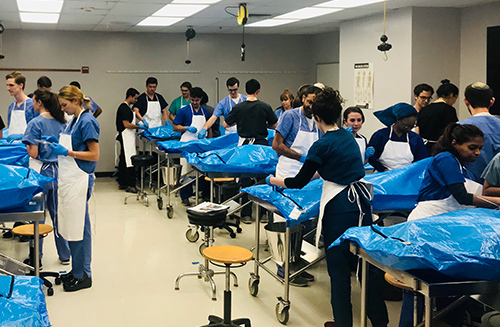 After being divided into small groups, the first-year students are assigned a deceased human body, or cadaver, to work with throughout the duration of gross anatomy lab, which spans into their second year. These groups dissect the same body together, take quizzes as a team and learn from each other. First-year medical students on the first day of gross anatomy lab on January 11. 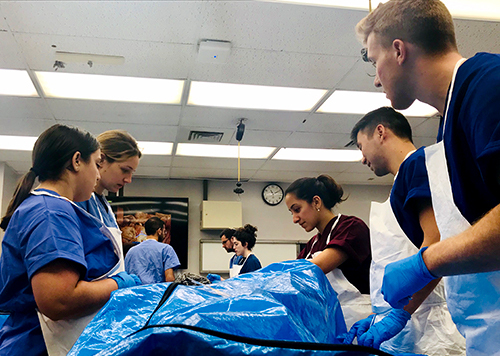 Trading in their textbooks for scrubs, the class of 2022 began gross anatomy on January 11, marking the first time that they worked with cadavers as part of their medical education. First-year students have found the support from their more experienced peers invaluable, especially when there are several groups dissecting in a room at the same time. Caroline King (M’22) began the gross anatomy course as a student in Georgetown’s Special Master’s Program, a one-year program tailored to college graduates applying to U.S. medical schools, and completed the full course over the summer to serve as a teaching assistant in her first year. She was excited to help her classmates by sharing her knowledge. Indirectly, the program has also fostered mentorship among students. Working in the lab for hours at a time has allowed for students to connect with their peers and ask questions on topics other than anatomy. Dissecting begins on the first day of class, after students are introduced to the instruments and the cadaver they will be working on for the next several months. Supporting first-year students in the anatomy lab is a way of giving back to a future generation of physicians, Arthur Jurao (M’19) said, reflecting on his own experiences. The ability to learn from the human body is not something that Georgetown students take lightly. In fact, as part of GUSOM’s Anatomical Donor Program, first-year students are given the opportunity to write an obituary for the deceased person whose body they will later dissect. Milos Tomovic (M’22) was one of the first-year students who volunteered to write an obituary and connected with the donor’s family prior to his first day in the lab. The students also spoke to the unique qualities of Georgetown’s Anatomical Donor Program, and how special it was to know that the donors chose to give their bodies to science. King echoed this sentiment by emphasizing the powerful choice made by donors and what it means for students.